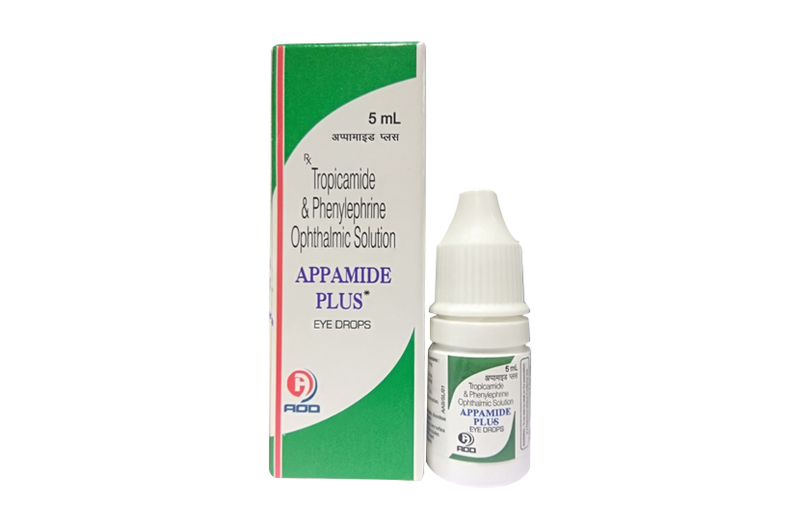 Appamide Plus- Eye Drops is used to treat inflammatory conditions of the uveal tract. It may also be used dilate the eyes prior to eye surgery. Do not use Appamide Plus- Eye Drops, if you have an eye infection or do not have a lens in the eye. You are also recommended to tell your physician about any other health conditions you have that may cause problems during treatment. Follow your physician`s instructions for using Appamide Plus- Eye Drops to get the most effective results. One to two drops are normally applied twice each day to treat uveal tract inflammation while one or two drops are administered thirty minutes prior to the planned surgical procedure. To apply the medication tilt your head backward, gently pull down the lower lid of the eye being treated, hold the bottle over the eye, and administer a drop into the pouch that is formed. Slowly close the eye to spread the solution and keep it closed for thirty seconds allowing it to be absorbed. Wait several minutes before applying the next drop if more than one is required. Observe the solution prior to each use to make sure it is not cloudy or discolored as this may indicate contamination. It is also important to never allow the tip of the applicator to touch any foreign surfaces, including the eye itself, as this may also lead to contamination.